Mic veterans Neumann turn their attention to the other end of the signal chain, with a miniature speaker that packs a big punch. The Klein + Hummel brand — named after its founders, Horst Klien and Walter Hummel — has long been associated with high-quality professional monitoring, as well as PA loudspeakers. However, the company were enrolled into the Sennheiser group about 10 years ago, and the studio monitor range has been marketed under the Neumann name in recent years, though thankfully retaining the 'KH' prefix. I've reviewed several K+H monitors over the years and have never been disappointed. In fact, the little O300 three-way monitor (reviewed at /sos/oct04/articles/kh300d.htm) remains a firm and highly recommended favourite. The latest offering from this historic brand is the even more compact KH120A, which was sent for review with its optional subwoofer partner, the surprisingly large KH810. The KH120A is apparently the first of a complete new line of KH monitors embodying some interesting new technologies, although in many ways it is the logical successor to the now obsolete O100, which I reviewed in SOS July 2007 (along with the still available O800 sub), and the current O110D. I suspect the O110D will disappear from the catalogue once the promised digital version of the KH120A becomes available. Slide switches govern the KH120A's bass, lower-mid and treble response, while the input gain and output level can be set via a rotary knob and another slide switch, respectively. 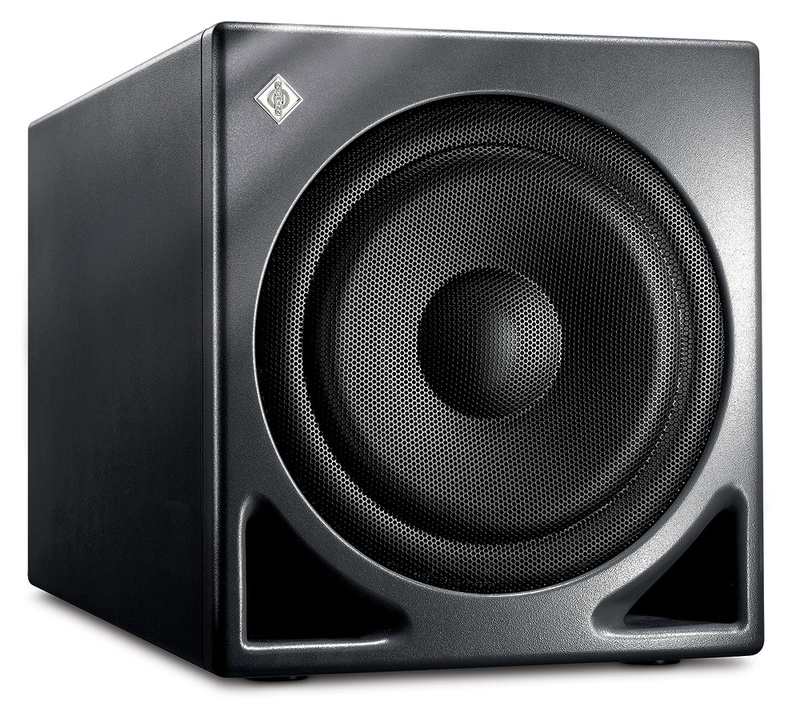 The KH120A studio monitor is a small, two-way, ported design intended for nearfield applications, or as a rear-channel speaker in a larger multi-channel system. 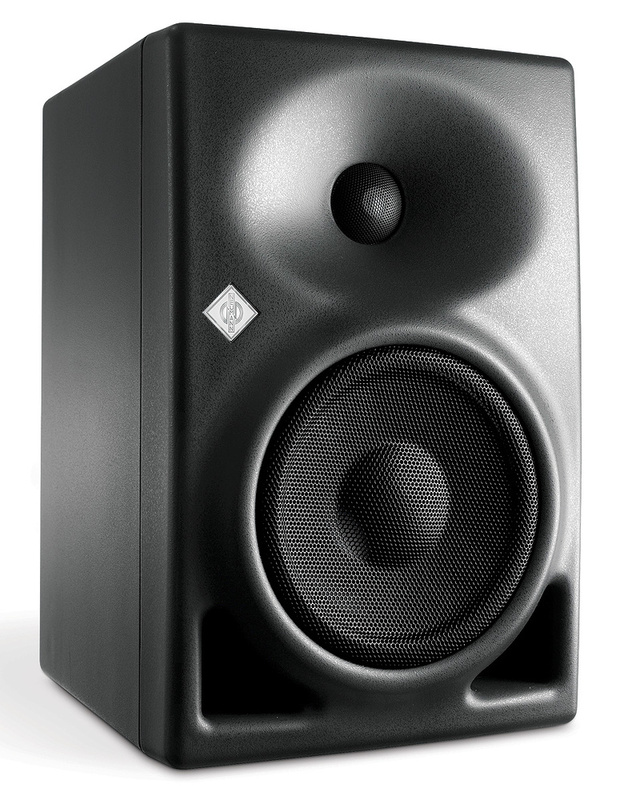 The cast-aluminium cabinet measures just 277 x 182 x 220mm (HWD) to enclose an internal volume of 6.5 litres, and weighs a little over 6kg, so these speakers are very easily portable and would make great reference monitors for engineers who go where the work is. The drive units comprise a long-throw, composite-sandwich, 130mm (5.25-inch) bass-mid unit, plus a titanium-fabric 25mm (one-inch) tweeter, with a fourth-order crossover at 2kHz feeding a pair of 80W Class-A/B amplifiers. A pair of triangular ports vent from the bottom of the front baffle to either side of the bass driver, which is a departure from the previous O100 and O110 models, in which the ports were at the top of the baffle. The front baffle is quite a chunky aluminium section bolted onto the rest of the cast-aluminium cabinet, and is heavily contoured to pull the bass driver slightly forward (presumably to aid in accurate driver time alignment). Conversely, the tweeter is recessed within an elliptical 'mathematically modelled dispersion' (MMD) waveguide, which helps to control both the vertical and horizontal dispersion of high frequencies. On the left-hand side between the two drivers is an illuminated Neumann badge, which is gently backlit in white when the speakers are powered, and flashes red if the internal protection system is activated. 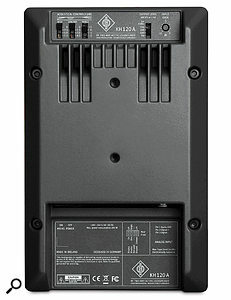 Facing down from a recessed shelf on the back panel is an electronically balanced XLR line input, mains on/off switch and an IEC power connector, along with a set of four switches. These allow the front-panel badge lighting to be turned off, if preferred, or set to normal or dim illumination levels (I preferred the dim option!). One of the switches also activates a ground-lift facility. 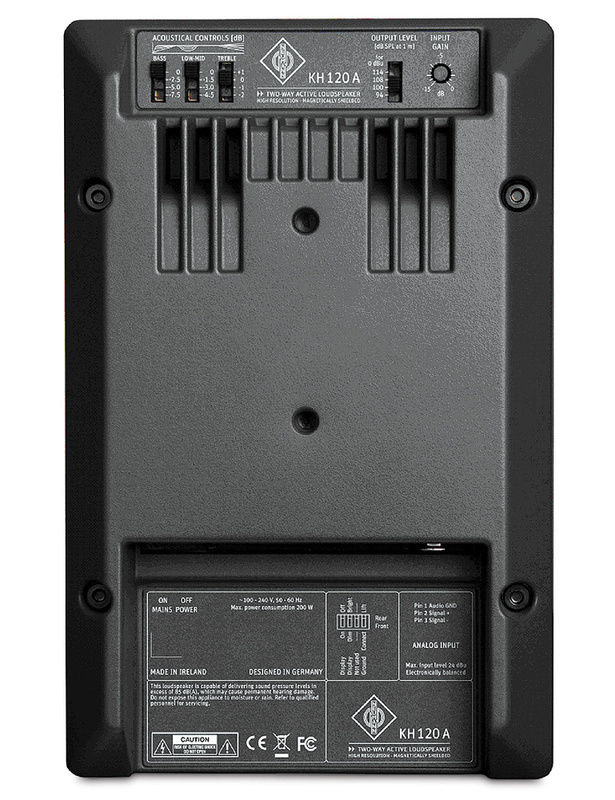 The middle portion of the rear panel accommodates a pair of 8mm threaded holes to allow attachment to a wall bracket, and, at the top (above some cooling fins) are four more configuration switches and a rotary sensitivity control. The first three switches allow the frequency response to be tailored to suit the speaker placement and room acoustics. The low end (below about 400Hz) can be attenuated by 2.5dB, 5dB or 7.5dB, and the mid-range (between 60Hz and 1.5kHz) by 1.5dB, 3dB or 4.5dB. The high end (above 5kHz) can be attenuated by 1dB or 2dB, or boosted by 1dB. The manual provides some suggestions for the appropriate settings for a range of installation situations. The last switch sets the output level achieved with an input of 0dBu. The options are 94, 100, 108 or 114 dB SPL (at one metre), and a rotary gain control allows the input to be attenuated by up to 15dB to fine-tune the actual volume. I used these monitors in a variety of different rooms and generally found the 100 or 108 dB SPL settings provided the perfect level for them as nearfields or mid-fields when working on speech and acoustic music. Despite the compact size, the KH120A punches well above its weight, with the spec sheet quoting a free-field frequency response extending between 54Hz and 20kHz (±2dB) — which is a remarkable LF extension for monitors of this size. The headline maximum SPL figure is 111dB at one metre, although a more useful real-world figure is 92dB (C-weighted) at 2.3 metres, tested with pink noise — rising to 94dB SPL if partnered with the KH810 subwoofer. That's a pretty healthy output for a speaker that you can pick up in one hand! K+H are very much an engineering-led company, and this is clearly evident in the impressive manual, which includes a full set of test and measurement plots — something that very few manufacturers have the courage or confidence to produce. The frequency plot confirms what my ears were telling me: that the response is very well controlled without any mid-range forwardness. Inevitably, there is some port resonance at about 60Hz, which is revealed clearly in group-delay and waterfall plots, but the rest of the time-domain response is very tidy. The directivity plots indicate how the MMD waveguide helps to control the vertical directivity, in particular, which minimises the interference caused by sound splashing off a console or desktop. Harmonic distortion is pretty respectable down to about 100Hz, below which it rises significantly, as it does with most speakers. The pictures of the KH810 subwoofer make it look like a compact, almost cubic box, but nothing could be further from the truth! The KH810 is huge and heavy — I'm talking about a 26kg box measuring 360 x 330 x 645mm (HWD). The MDF cabinet is ported with a pair of triangular vents in the bottom corners, and a diamond Neumann badge in the top-left corner. The specifications quote a bandwidth of 19Hz to 300Hz (±2dB), and its internal 200W amplifier is capable of producing 112dB SPL at one metre. The rear panel is very busy, because the KH810 incorporates a full 7.1-channel bass-management system. 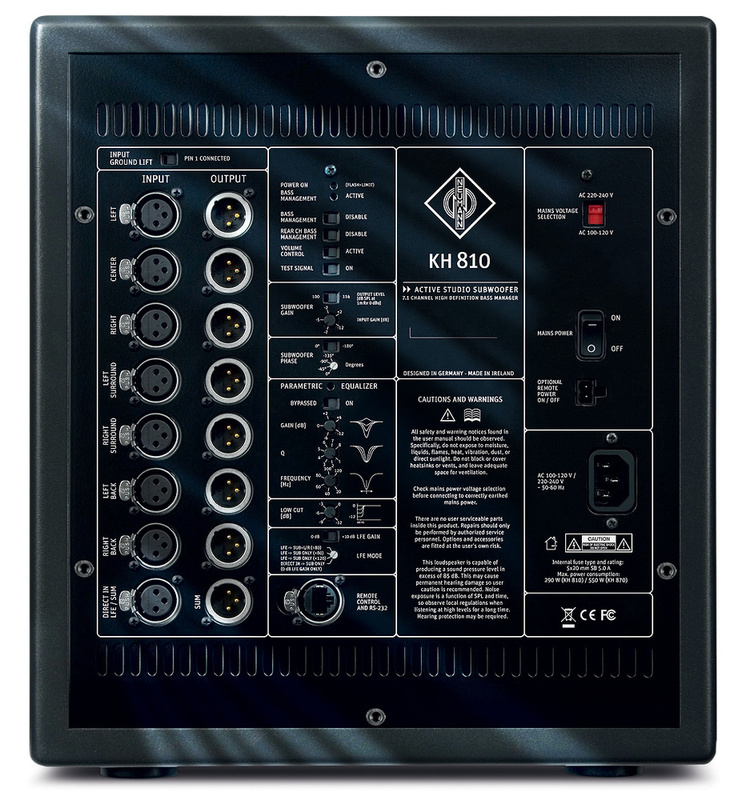 Consequently, there are 16 XLR sockets providing inputs and outputs for left and right front, left and right surround, left and right back, centre and LFE/sub. Cleverly, in situations where a 7.1 surround rig is unnecessary, the 'spare' left and right back channels can be used for a separate 2.1 stereo system that shares the same subwoofer. As with the KH120A, the rear panel carries lots of switches and controls to customise the configuration. Slide switches provide a ground lift, and enable or disable the bass management — either on all the outputs, or just on the 'back' channels. When the bass management is engaged, an 80Hz high-pass filter is inserted into each channel output, removing bass from the satellite speakers and routing it to the subwoofer instead (along with the LFE signal, if present). Another switch turns on an 80Hz test signal to help adjust the subwoofer phase (adjustable in 45-degree steps) to match the satellite speakers. 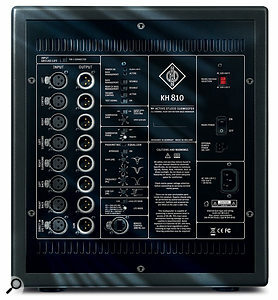 A rotary control adjusts the subwoofer sensitivity, and a slide switch adds an additional 10dB of LFE gain to adhere to the Dolby Digital requirements. Four more rotary controls provide a single-band parametric equaliser and a low-cut filter to help with room-tuning and optimisation. The parametric EQ can be tuned between 20 and 120 Hz, with a gain range of +4dB to -12dB. Its Q can be set between 1 and 8, while the filter provides up to 12dB of attenuation below about 30Hz. A rotary mode switch determines how the bass management works for the subwoofer signal, with options for 80Hz and 120Hz filtering, or no low-pass filtering at all. The sub also has the ability, when in the 80Hz mode, to route any LFE signals above 80Hz to the front left and right speakers instead of the sub. A Cat5 socket is provided for a bespoke RS232-based remote control facility, using a Neumann NRC1. This allows the volume of the entire 7.1 system to be controlled, if required, with facilities for channel muting, activation and deactivation of the bass management, and so on. The KH810 subwoofer has enough inputs and outputs to accommodate a 7.1-speaker surround-sound setup, and the controls allow for comprehensive monitor-system configuration. The KH120A is a very impressive speaker, which performs to far higher standards than its size and plain demeanour might suggest. It's undoubtedly a very clean, neutral and transparent monitor that is capable of working at silly volumes if required, all of which make it equally well suited to rock, pop, classical or speech work. The last is probably the most demanding, in fact, because any speaker coloration stands out like a sore thumb when listening to a known voice. However, the KH120A sailed through all my tests with flying colours, and I used them on a Lieder (piano and soprano) location recording in place of my usual PMC TB2As with great success. Stereo imaging was very stable, with a broad 'sweet spot' and an excellent sense of depth and space. Transients were portrayed with very natural dynamics, while the frequency response was smooth and natural, conveying the bass end remarkably well without any hype or exaggeration, and with minimal 'overhang'. The high end was smooth and clean, sounding very open and light without any grittiness, while the mid-range was honest and truthful. Hi-fi speakers tend to recess the mid-range a little to provide a more laid-back and engaging sound, while many 'monitors' hype the mids to give a forward or even 'shouty' quality, to try and make them sound more analytical. The KH120As have no need for such shenanigans — they are brilliantly revealing and detailed, and there's no need to scorch your ears off! And for anyone who has had bad experiences with noise from active speakers, I'm please to report that the KH120A is utterly silent at the listening position, with barely audible hiss if you put your ear close to the drivers. Hooking up the gargantuan (in comparison) KH810 subwoofer transformed the little KH120As into a monstrous full-range system, which goes beyond trouser-flapping territory and into full-scale commercial demolition! This sub packs some impressive power and really does go down a very, very long way. Frequency-response matching is faultless provided a little care is taken to set the phase and levels sensibly. I'm used to full-range monitoring with my PMC IB1s and TLE1 subwoofer, but even I was surprised by what this KH system could deliver in a much smaller package. If you're in the market for a very high-quality, accurate and highly revealing compact monitor then the KH120A should definitely be on your audition list — I would recommended them very highly indeed. And if you want to know what's happening in the bottom two octaves, or if you want a little more power, consider budgeting for the KH810. I can guarantee you won't be let down. Compact, active two-way speakers are plentiful, but for real quality monitoring the current benchmark models start at around £1000, which is precisely where the KH120A has been positioned. This puts it in the midst of competition like the Genelec 8130A, the Quested S6R, the Focal CMS65, Dynaudio BM6A MkII, and the passive PMC TB2S+, all of which are very competent small monitors separated only by personal tonal preferences. The KH120As have a surprisingly wide bandwidth for such a small speaker. Excellent resolution with a very neutral, transparent and detailed sound. Extremely robust, with superb build quality. Room-correction facilities well thought out and easy to implement. Near-perfect integration with the partnering KH810 subwoofer. Configurable 7.1-speaker bass management built into the subwoofer. Superbly informative and detailed manuals. None at all at this price — it's a genuine bargain! the matching KH810 subwoofer to make an impressive full-range, multi-channel surround system. KH120A £1198.99 per pair. KH810 £2682 each. Prices include VAT. KH120A $1499.90 per pair. KH810 $2699.95 each.